The Lost Colony is the popular name given to the English colony of approximately 150 men, women, and boys that settled on Roanoke Island in July 1587 under the leadership of artist John White. The colony was one of Sir Walter Raleigh's efforts to establish an English settlement on the coast of the New World in what is now North Carolina. Like previous voyagers, White and his crew sailed through the West Indies, but they did not trade there. Although they had expected to settle on the Chesapeake, their pilot, Simon Fernándes, refused to transport them after they stopped to look for a handful of men presumably left on Roanoke Island by Sir Richard Grenville the previous year. These new colonists found no sign of Grenville's men. Reluctantly, White ordered the settlers to establish themselves in the abandoned town. There, on 13 Aug. 1587, Manteo, a friendly Croatoan Indian, was baptized and made Lord of Roanoke and Dasamunkepeuc by order of Raleigh. On 18 August Virginia Dare was born to White's daughter Eleanor and her husband, colony leader Ananias Dare, becoming the first English child born in the New World. A few days after his granddaughter's christening, White sailed back to England to hasten and encourage efforts to resupply and reinforce the colony. His departure marked the last known contact between the English and their colony in America. The Spanish Armada of 1588 disrupted efforts to send voyages to Virginia. White was able to get away to sea that year in two small vessels with 15 new settlers, but these ships were beset by calamities common in this age of privateering and returned home. On 7 Mar. 1589 Raleigh reached an agreement with White and numerous merchants of London to put the colonizing effort on firmer financial ground in exchange for Raleigh's grant of certain trading rights to the investors. In 1590 White was finally able to secure passage back to Roanoke Island aboard another privateer. He reached the Virginia coast in mid-August. 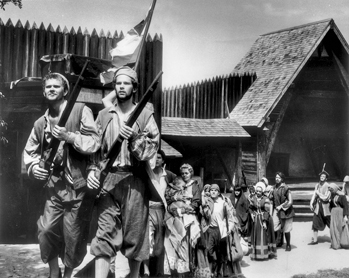 On 18 August, the third birthday of his granddaughter, colonist Virginia Dare, White once again landed on Roanoke and began a search for the colonists he had planted there. He soon discovered that the colony was deserted and the houses of their settlement had been dismantled. His primary clue to the potential whereabouts was the word "CROATOAN" cut into a tree or post of a palisade built sometime after his departure in 1587. White took this as a sign that the colonists had abandoned the Roanoke Island settlement without immediate distress. He also found ruined articles from chests he had left with the colonists, which they had buried and the Indians had excavated. Stormy seas and lack of cooperation on the part of the sailing masters prohibited White from any further search for the colony in 1590. Raleigh claimed to have sent other expeditions to regain contact with the colonists, but none was successful. The eventual fate of the Lost Colony has both fascinated and puzzled even casual students of early American history for centuries. English explorers and settlers at Jamestown in present-day Virginia searched for the colonists in the early seventeenth century but found none of them, coming eventually to believe that most, if not all, of the Roanoke settlers had died at the hands of belligerent Indians. Since then, others have speculated that the colonists may have intermixed with the Indians of the North Carolina Coastal Plain, one theory advancing the idea that they are among the ancestors of the modern Lumbee Indians. Other theories suggest natural disaster as the reason for the colony's disappearance. Despite the abundance of speculation, imagination, and even outright fabrication on the part of various theorists, the fate of the Lost Colony remains as much a mystery today as it was in the sixteenth century. Thomas Schouweiler, The Lost Colony of Roanoke: Opposing Viewpoints (1991). David Stick, Roanoke Island: The Beginnings of English America (1983). Roanoke colonies research newsletter; East Carolina University. Roanoke Colonies Research Office, Semiannual; Vol. 1, no. 1 (Nov. 1993). Croatan Indians of Sampson County, North Carolina: their origin and racial status: a plea for separate schools, Butler, Geo. E. (George Edwin), 1868-1941., 1916. I am currently doing some research on the lost colony and personally I have found your site to be unhelpful to me. I have used this site before for projects and it has given me good information. However, this time I feel that, while he’s your information is correct and the colony is missing and is a mystery so there isn’t that much information that we have, I feel like the subject should have a little bit more information on this site. Yeah, if this person is such an authority on the subject, and instead of simply criticizing, why not share some of this vast info they've accumulated to better educate us all? Facts change and new ones come to light. No one has a monopoly on wisdom, and the mystery of the Lost Colony could really help us in moving forward with understanding in a possible assimilation of these people by the Native inhabitants. The above comment wasn't only rude it's ignorant.